As many of you know I am an iPhone guy and really can’t see myself using any other cell phone. That being said, I have a responsibility to my readers, and the tech community in general, to be up to date and educated on multiple devices and operating systems. That is why when Mr. Jon Rettinger sent me a Motorola Droid I decided to be an Android guy for a solid week in order to understand the Android culture. the operating system. Keep in mind I am using a Droid that is not brand new and out of the box, but the OS observations will be pretty universal. The first thing that I noticed is not all Android phones are created equal as I was running Android version 2.2 while others I came in contact with were running 2.1 or lower. I asked why they had not updated and to my surprise they mentioned how not all Android phones are privileged enough to get the latest updates. This seemed very odd to me as most iOS devices are kept on the current version throughout their life cycle unless of course the user does not update the software. I was pleasantly surprised at the short learning curve and usability of the Android operating system and most tasks seemed snappy and efficient with the exception of some games. I occasionally came across an application or two that would “stutter” during operation or game play, but this may be attributed to hardware performance or the design of the application itself and not that of the operating system. One big issue I could not get over is the poor design and layout of the Android marketplace. 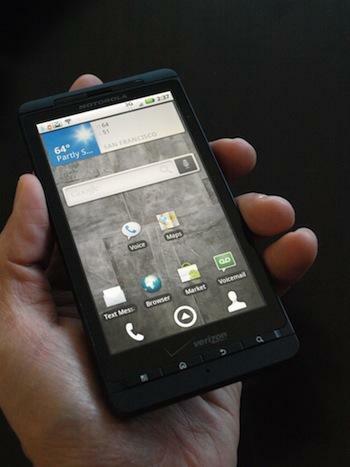 With so many apps to choose from it is difficult to search and browse potential apps on the handset itself. For the life of me I can’t understand why Google has put so much time and effort into Android yet has not made it possible for users to search all applications on the internet. Now I may be spoiled with the ease of use with iTunes, but this really needs to be remedied for easier use. In general my Android experience was a pleasant one and if AT&T or Apple ever got under my skin I think I would be happy moving to an Android device. Don’t get me wrong, I was extremely happy to have my beloved iPhone back in my dirty little hands and I still prefer iOS but Android is solid and will only get better with development. Have you moved from one OS to another? What was your experience like? Were you happy with the move or did you regret it? As always I look forward to your comments.